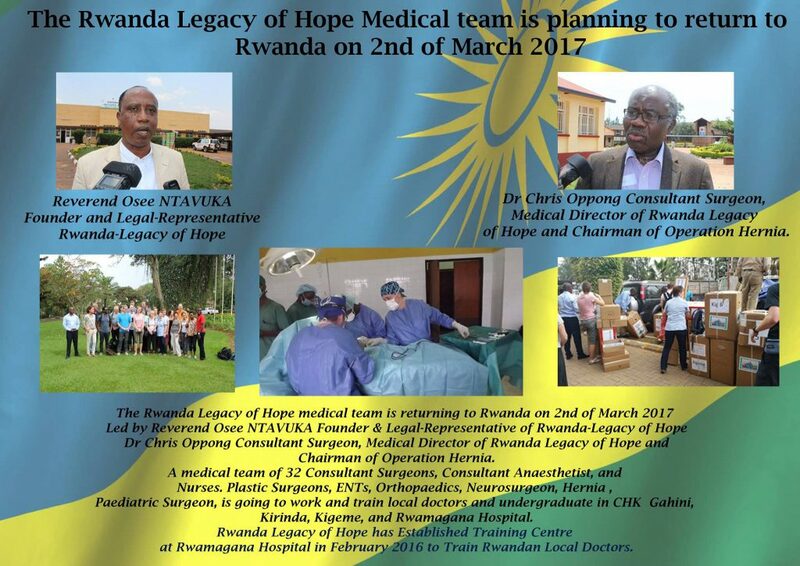 The Rwanda Legacy of Hope medical team is planning to return to Rwanda in February 2016. Plastic Surgery, ENT, Orthopaedics, Physiotherapy, Hernia Operation, to work and train local Doctors in Remera–Rukoma, Gahini, Kilinda,Nyamata,Kigeme,Kibogora and CHK Hospital.This service is free of charge. You are free to bring or invite anybody who needs help. Please we will also appreciate your prayers to God for these two groups so that they can deliver their service successfully. Rwanda Legacy of Hope is searching for volunteers! We need consultant surgeons in plastic surgery, ENT, Orthopaedics, Nurses, Physiotherapists, IT professionals and Teachers who would like to do voluntary work in Rwanda in February 2016 and subsequent missions planned for 2016/2018. We also need teachers who can provide classroom support in lesson planning and English methodology for Rwandan schools.